Looking west from the PCT trail. After a few minutes of hiking, we are afforded nice views of Lake Mary and Summit Valley to the west. The peak on the left is Crows Nest (7896'), adjacent to Sugar Bowl ski area. PCT - Visit the Pacific Crest Trail Association website. Hiking east along a jeep trail toward Donner Peak saddle. Barely visible in this photo is a communications relay reflector, which will see from the other direction once up on Mt. 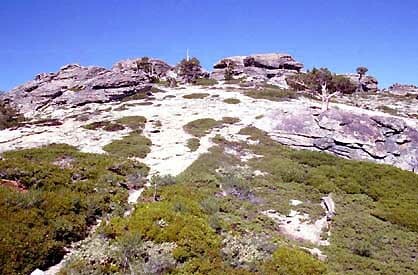 Judah ridge. Donner Peak from the south. 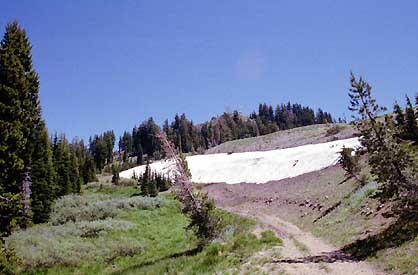 Once reaching Donner Peak saddle, there is a five- to seven-minute scramble up this slope to the top. 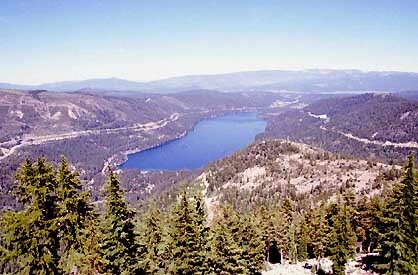 Donner Lake from atop Donner Peak (8019'). The views from the summit are splendid. This one is looking northeast toward lake. 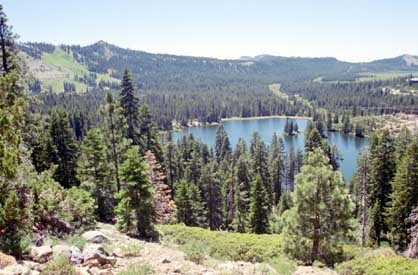 The road cut to the left (north) of the lake is Interstate 80, heading to Reno. The road cut on the right is the Southern Pacific railway. Just beyond the lake is the town of Truckee. 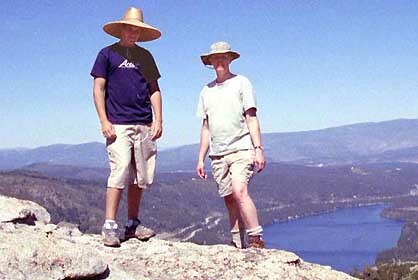 Micah and Dan on the peak. This is one of my favorite destinations, well worth visiting each summer. We've hiked it from various directions, but the one today is the easiest, about one hour from PCT trail head at Donner Pass. A real top-of-the-world feel. This page was last updated May 21, 2003.